From Old Trafford to Broadwood, former Manchester United youth John Rankin has BBC Radio Scotland's Off The Ball to thank for the latest stop in his long career. 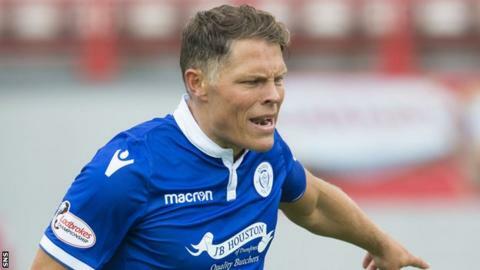 The 34-year-old midfielder received an email from a Clyde director while he sat in the studio after revealing he was being released by Queen of the South. Even more surprising than the former Ross County, Hibernian and Dundee United player's appearance in the fourth tier is that of Chris Johnston. Once tipped as a Scotland international of the future while at Kilmarnock, the 23-year-old's career has gone backwards since a serious knee injury. After spells with Raith Rovers and Dumbarton in the Championship, the former Scotland Under-19 cap was loaned out by the Sons to Peterhead last season and he finds himself back in League Two on a permanent deal, this time with Annan Athletic. Former Killie team-mate Conrad Balatoni is the latest former top-flight player to join the Edinburgh City ranks, the defender joining from Torquay United. However, as the 27-year-old arrives, former Scotland striker Craig Beattie has switched to League Two rivals Elgin City, while former Hibernian forward Farid El Alagui and one-time Hamilton Academical defender Jesus Garcia Tena have exited amid a Citizens clear-out. The 20 goals that made Alan Trouten the second top scorer in League One last season could not help Albion Rovers avoid relegation and the 32-year-old will not be around to assist their promotion quest as he has won a step up to the Championship with promoted Alloa Athletic. In: John Cunningham, forward (Alloa Athletic); Steven Smith, defender (Alloa Athletic); Ronan Kearney, forward (Alloa Athletic); Dylan Monaghan, midfielder (Alloa Athletic); Christopher Wylie, goalkeeper (Alloa Athletic); Sean Fagan, midfielder (Alloa Athletic); Lewis Wilson, defender (Clyde); Lewis McLear, midfielder (Edinburgh City); Graham Gracie, forward (Larkhall Thistle); Alan Murdoch, defender (Blantyre Vics); Bryan Wharton, defender (Pollok); Jamie Watson, forward (Kilsyth Rangers); Scott Forrester, defender (Glasgow Perthshire); Lawrence McMahon, midfielder (Winton Rovers). Loan: Scott Gray, defender (Rangers); Aaron Reid, defender (St Mirren); Lee Duncanson, defender (Partick Thistle). Out: Brian Kerr, manager (East Kilbride); Alan Trouten, forward (Alloa Athletic); Ross Perry, defender (Dumbarton); Joao Vitoria, forward (Airdrieonians); Alan Reid, defender (Stenhousemuir); Ross Davidson, midfielder (East Fife); Jason Marr, defender (Stirling Albion); Scott McLean, forward (Queen's Park); Graeme Holmes, midfielder (East Kilbride); Sean Higgins, forward (retired); Scott McLaughlin, midfielder; Craig McLeish, midfielder; Gareth Hallford, goalkeeper; Callum MacDonald, defender; Graham Bowman, goalkeeper; Michael Hopkins, midfielder; Daniel Lightbody, defender; Callum MacDonald, defender; Ryan McManus, forward; Marcus McMillan, goalkeeper; Michael McMullin, defender; Daniel Potts, defender; John Queen, forward; Conor Scullion, midfielder. Loan ended: Daniel Baur, defender (Heart of Midlothian); Kieran Wright, goalkeeper (Rangers); Harlain Mbayo, defender (Aberdeen); Kane Hester, forward (Arbroath). In: Chris Johnston, midfielder (Dumbarton); Ross Fergusson, forward (Queen of the South); David Wilson, midfielder (Dumbarton); Max Wright, forward (Clyde); Jonny Jamieson, goalkeeper (Gretna 2008); Tommy Muir, forward (Dalbeattie Star). Out: Jamie Henry, midfielder (Brechin City); Rabin Omar, forward (Elgin City); Blair Henderson, forward (Edinburgh City); Jim Atkinson, goalkeeper; Ellis Pearson, defender. Loan ended: Cameron Salkeld, forward (Carlisle United); Evan Horne, midfielder (St Mirren); Ben Armour, forward (Greenock Morton); Conor O'Keefe, midfielder (St Mirren). In: Jack Ogilvie, midfielder (Livingston); Ally Adams, goalkeeper (Musselburgh Athletic); Sean Murphy, midfielder (Musselburgh Athletic); Jed Davie, midfielder (Musselburgh Athletic); Daryl Healy, forward (Selkirk); Jordan Purves, defender (Tynecastle); Daniel Purves, midfielder (Tynecastle); Bruce McCrorie, defender (Tranent); Marc Malloy, forward (Lothian Thistle Hutcheson Vale); Brandon Blair, midfielder (Lothian Thistle Hutcheson Vale); Lee Barrett, forward (Whitehill Welfare); Andrew Malcolm (Glenrothes Strollers); Callum Ashford (Glenrothes Strollers); Ben Rolland (Glenrothes Strollers); John Neil, midfielder (unattached). Loan: Cedwyn Scott, forward (Dundee). Out: Keiran Stewart, midfielder (Edinburgh City); Steven Thomson, midfielder (Bonnyrigg Rose Athletic); Jonny Fairbairn, defender (Coldstream); Steven Notman, midfielder (retired); Kevin McKinlay, defender; Paul Simpson, midfielder. Loan ended: Robbie McCrorie, goalkeeper (Rangers); Alex Petkov, midfielder (Heart of Midlothian); Jack Hamilton, forward (Livingston). In: Jack Boyle, midfielder (Huddersfield Town, loan to permanent); Dylan Cogill, defender (Huddersfield Town, loan to permanent); David Hopkirk, forward (Derry City); Mark Lamont, midfielder (Partick Thistle, loan to permanent); Ross Lyon, midfielder (Rangers); John Rankin, midfielder (Queen of the South); Joe Gorman, defender (Blyth Spartans); Eddie Ferns, midfielder (Stenhousemuir); Scott Rumsby, defender (Cowdenbeath); Kieran Hughes, goalkeeper (Kilbirnie Ladeside). Out: Smart Osadolor, midfielder (Queen's Park); Jordan Lowdon, defender (Elgin City); Max Wright, forward (Annan Athletic); Lewis Wilson, defender (Albion Rovers); Steve Kipre, forward; Jack Breslin, defender; Matt Flynn, midfielder; Callum Home, defender. Loan ended: Dylan Cogill, defender (Huddersfield Town); Jack Boyle, midfielder (Huddersfield Town); Kyle Gourlay, goalkeeper (Dundee); Adam Martin, midfielder (Alloa Athletic). Loan: Aaaron Miller, forward (Pollok). In: Jason Talbot, defender (Dunfermline Athletic); Blair Malcolm, defender (Ross County, loan made permanent); Kris Renton, forward (Alloa Athletic); Ryan Goodfellow, goalkeeper (East Fife); Martin Scott, midfielder (Stenhousemuir); David Marsh, defender (Stenhousemuir); Pat Scullion, defender (Edinburgh City); Jordyn Sheerin, forward (Kelty Hearts, loan to permanent). Loan: Robbie Deas, defender (Celtic). Out: Scott Rumsby, defender (Clyde); Ali Smith, midfielder (Whitehill Welfare); Joe McGovern, goalkeeper; Shaun Rutherford, defender; Jack Whittaker, midfielder; Matthew McInally, defender; Ben Reilly, defender; Jordan Hornby, defender; Blair Penman, goalkeeper; Sean McManus, midfielder. Loan ended: Blair Malcolm, midfielder (Ross County); Brandon Luke, midfielder (Dunfermline Athletic); Craig Henderson, midfielder (Livingston). Loan: Cammy Muirhead, forward (Civil Service Strollers). In: Conrad Balatoni, defender (Torquay United); Danny Handling, midfielder (Dumbarton); Graham Taylor, midfielder (Dundee United, loan to permanent); Blair Henderson, forward (Annan Athletic); Allan Smith, forward (Peterhead); Andy Black, midfielder (Stirling Albion); Kieran Stewart, midfielder (Berwick Rangers); Brad Donaldson, defender (Musselburgh Athletic); Robbie McIntyre, defender (Tynecastle). Loan: Adam Watson, midfielder (Livingston). Out: Zdravko Karadachki, midfielder (Alloa Athletic); Craig Beattie, forward (Elgin City); Jesus Garcia Tena, defender (Stenhousemuir); Lewis McLear, midfielder (Albion Rovers); Pat Scullion, defender (Cowdenbeath); Moses Olanrewaju, midfielder (East Stirlingshire); Chris McKee, defender (East Stirlingshire); Farid El Alagui, forward; Ashley Grimes, forward; Shaun Harrison, defender. Loan ended: Matthew Shiels, defender (Rangers); Scott Shepherd, forward (Falkirk); Cameron Blues, midfielder (Falkirk); Stuart Morrison, defender (Dunfermline Athletic). In: Craig Beattie, forward (Edinburgh City); Jordan Lowdon, defender (Clyde); Kerr Hay, forward (Montrose); Rabin Omar, forward (Annan Athletic); Thomas McHale, goalkeeper (Truro City); James McGowan, defender (Thame United); Ryan Farquhar, defender (Lossiemouth); Scott Miller, midfielder (Turriff United). Loan: Kyle Gourlay, goalkeeper (Dundee); Greg Morrison, forward (Ross County); David Banjo, defender (Selkirk). Out: Thomas Reilly, midfielder (Forfar Athletic); Jordan Allan, defender (Stirling Albion); Iain Ross, goalkeeper; Calum Ferguson, forward; Aaron Whitehead, defender; Chris Dodd, midfielder. Loan ended: Zak Elbouzedi, midfielder (Inverness Caledonian Thistle); Brett Long, goalkeeper (Dundee United); Nathan Flanagan, midfielder (St Mirren); Andrew McDonald, defender (St Mirren). In: Derek Lyle, forward (Queen of the South); Paddy Boyle, defender (Ayr United); Mick Dunlop, defender (Stenhousemuir); Ross Kavanagh, midfielder (Stirling Albion). Out: Mason Robertson, midfielder (Real Kashmir); Allan Smith, forward (Edinburgh City); Jordon Brown, midfielder (Cove Rangers); Fraser Hobday, goalkeeper (Turriff United); Scott Adams, midfielder (Buckie Thistle); Mark Lawrence, midfielder (First Point USA); Abdelkarim Belmokhtar, forward. Loan ended: Chris Johnston, midfielder (Dumbarton). Loan: Lewis Buxton, midfielder (Ellon United). In: Jordan Hart, goalkeeper (Ayr United); Adam Martin, midfielder (Alloa Athletic); Josh Peters, forward (Forfar Athletic); Smart Osadolor, midfielder (Clyde); Scott McLean, forward (Albion Rovers); Jamie McKernon, midfielder (Glenafton Athletic); Daniel Kindlan, forward (Wishaw); Dean Kindlan, midfielder (Wishaw); Kurtis Roberts, midfielder (Kilbirnie Ladeside); Dominic McLaren, midfielder (Kilbirnie Ladeside); Brendan Sharp, forward (Johnstone Burgh); Jack Dunlop, goalkeeper (Johnstone Burgh); Gavin Lachlan, midfielder (Cumbernauld Colts); Kieran Moore, forward (Lochgilphead Red Start). Out: Ross Millen, defender (Kilmarnock); David Galt, midfielder (Alloa Athletic); Adam Cummins, defender (Stranraer); Sean Burns, defender (Brechin City); Luke Donnelly, midfielder (Stranraer); Anton Brady, midfielder (East Kilbride); Thomas Orr, forward (BSC Glasgow); Michael White, goalkeeper (Irvine Meadow); Connor McVey, midfielder (Kilbirnie Ladeside); Kevin Green, defender (Beith); Dominic Docherty, midfielder. Loan ended: Jamie Gullan, midfielder (Hibernian); Aidan Keena, forward (Heart of Midlothian); Robbie Leitch, midfielder (St Mirren). In: Daniel Jardine, midfielder (St Johnstone, loan to permanent); Cammy Thomson, defender (St Johnstone); Mark Stewart, forward (Dumbarton); Jason Marr, defender (Albion Rovers); Jordan Allan, defender (Elgin City); Kevin Fell, forward (UB United); Willie Robertson, midfielder (unattached). Loan: Calum Ferrie, goalkeeper (Dundee); Neil McLaughlin, forward (Motherwell). Out: Andy Little, forward (Dumbarton); Ross Kavanagh, midfielder (Peterhead); Andy Black, midfielder (Edinburgh City); Ewan McNeil, defender (Pollok); Ross Smith, defender (BSC Glasgow); Steven Noble, defender (Beith); Craig Wright, goalkeeper (retired); Liam Caddis, midfielder; Sean Dickson, midfielder; Connor McMullan, midfielder. Loan ended: George Stanger, defender (Hamilton Academical).